Rhododendron ‘Roseum Elegans’ is an evergreen catawbiense hybrid from 1851 that has a lot to offer. ‘Roseum Elegans’ is a large-leaf rhododendron and a vigorous grower, able to grow an average of 20-25cm a year with a 2-3m end goal. 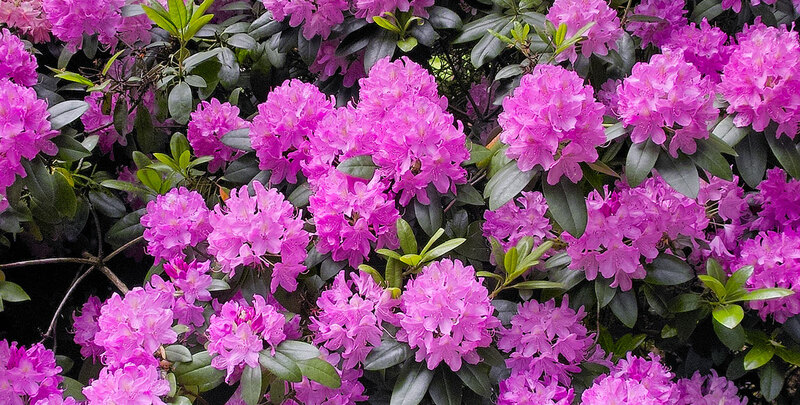 It is fairly easy to grow provided it is planted in the right soil (well-drained, acidic, humus-rich, moist) or if the soil is treated with special rhododendron compost. Should your soil require preparation, the profusion of lavender flowers with reddish brown spots that emerge from the purple flower buds in May will definitely make it worth your while. The flowers change to pink mid June, adding a lovely accent to your garden after the lavender colour fades. This plant is ideal for brightening shady areas or as a screening hedge or windbreak. Rhododendron ‘Roseum Elegans’ has a dense growth habit and year-round structure. It tolerates cold, heat and sun and is hardy all the way down to -20C. Ideally, rhododendron ‘Roseum Elegans’ is awarded a position is part shade for the sake of its beautiful flowers. The flowers should be dead-headed after they fade to stimulate new growth. When the flowers are gone this rhododendron will still stand out with its lovely olive-green foliage.